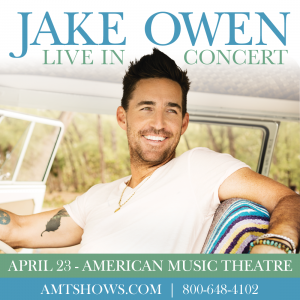 Home > AMT Blog > Jake Owen is Bringing a Night of High-Energy Country with His Signature “Laid-Back” Feel to American Music Theatre April 23! Jake Owen is Bringing a Night of High-Energy Country with His Signature “Laid-Back” Feel to American Music Theatre April 23! With six singles to top the charts including; “Barefoot Blue Jean Night,” “Beachin’,” “Anywhere with You,” “Alone with You,” “The One That Got Away,” and “American Country Love Song,” there’s sure to be something to get you up and moving this April! While many singers may have literally given up their day job to take the stage, Jake Owen’s interesting career path turned tragedy into triumph. So just how does a 15-year-old with aspirations of being a pro golfer become such an accomplished country artist? When a wake boarding accident caused a severe injury to his shoulder, keeping him off the course indefinitely, Joshua Ryan “Jake” Owen, decided to pick up his roommate’s guitar and teach himself to play. After playing a few small gigs at a local campus bar, Owen moved to Nashville. During his road trip, Owen stopped at a bank to open up a savings account. Owen mentioned to the bank teller that he was a singer-songwriter and she asked if he had any recordings available. He handed her a CD of his work, which she then passed over to the Warner/Chappell Music publishing company…proof that when one door closes, another one opens with new opportunities. Owen has opened for country greats like Brad Paisley and Carrie Underwood and has toured with the likes of Alan Jackson and Keith Urban. He has a style all his own and is sure to delight the country fan in all of us. Starting at 7:00 PM on April 23, Jake Owen will be bringing the heart of small town country straight to the stage. So brush off your boots and join us for a night of great music!